Duracell continues its Christmas campaign in the UK with a new spot, that encourages people to make their gift complete with Duracell. 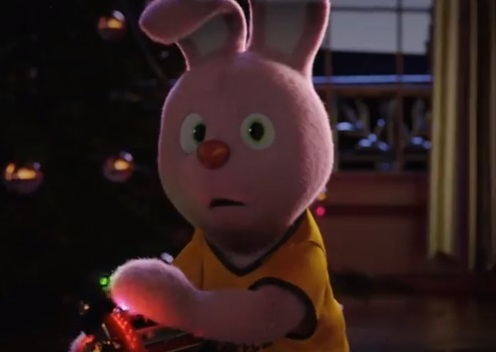 The 2-minute animated film features the Duracell bunny as he follows Santa everywhere he goes and makes the kids’ gifts complete by putting in them Duracell batteries. Arrived in a little girl’s home, he unpacks a gift box that contains a robot and he almost gets caught due to the noise the toy is making once the right battery is placed inside it. The girl leaves her room and slowly walks down the stairs into the living room, where the Christmas tree is. However, the Duracell bunny manages to flee just in time, without being seen. Serving as the soundtrack is the 2017 single “Pearl,” written and composed by Benoit Clerc and performed by French-American singer Margaux Christie. The advert is available as shorter versions, of 60, 30 and 5 seconds. life would look like if he hadn’t used Duracell batteries in various items around the house. Santa pictures then his teenage daughter getting angry because she can’t play her electric keyboard, his young son’s joy vanishing as the remote-controlled dinosaur dies, and his wife tripping over the respective toy and falling over the Christmas tree, whose lights are not lit. Another ad features Santa and his two youngest kids in the battery aisle, buying lots of Duracell batteries.